Final election results have been posted for all three counties. The final results for Proposition 2D in Adams County shows a 60% to 40% margin in favor of keeping the pit bull ban (total votes 6,744). 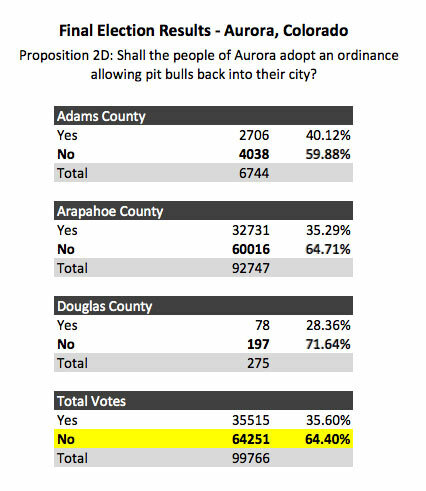 Arapahoe County, which contains the bulk of the Aurora voters, shows a 65% to 35% margin in favor of keeping the pit bull ban (total votes 92,747). Douglas County, with only a small number of Aurora voters, shows a 72% to 28% margin in favor of keeping the pit bull ban (total votes 275). To reiterate once again, the 2012 primary vote in Miami-Dade County pertaining to their pit bull ban had a very similar margin of victory -- 63% to 37% -- along with a similarly "negative" ballot question. The Miami-Dade ballot question was worse than Aurora's, it read: "Shall the ordinance repealing the County's 23 year old law prohibiting the ownership of pit bulls as a dangerous breed of dogs become effective?" 63% of Miami-Dade citizens voted no, upholding the pit bull ban. Local and out-of-state pit bullies did not take the defeat in Aurora too well. In a recent Aurora Sentinel editorial by Dave Perry, he remarks that the "war against common sense isn't over by a long shot." The Sentinel continues to get "hounded" by pit bullies. "I’m not talking, call-the-editor-and-give-him-a-piece-of-my mind-verbal-wrestling," Perry writes. "I’m talking about vicious, foaming-at-the-mouth attacks from humans who make their scary dogs look like Hello Kitty." Difficulties in counting ballots in Adams County has left at least two important candidate races uncalled in Colorado. The county still has about 10,000 ballots to count, according to the Aurora Sentinel. It is unclear what portion of the remaining ballots affects Aurora. Current results for Proposition 2D show a 65% to 35% margin in Arapahoe County, 72% to 28% margin in Douglas County and a 62% to 38% margin in Adams County. Combined, 65% of Aurora citizens voted no. More ballot numbers rolled in over the course of the night. The latest results of the combined counties show that 66% voted no and 33.5% voted yes. The Aurora Sentinel tweeted earlier that Adams County still has 25,000 ballots to count, but only a portion involve Aurora. The current margin is similar to the Miami-Dade pit bull ban vote in 2012, which had a 63% to 37% margin. That vote, however, was a county primary in August, not a general elections vote in November. 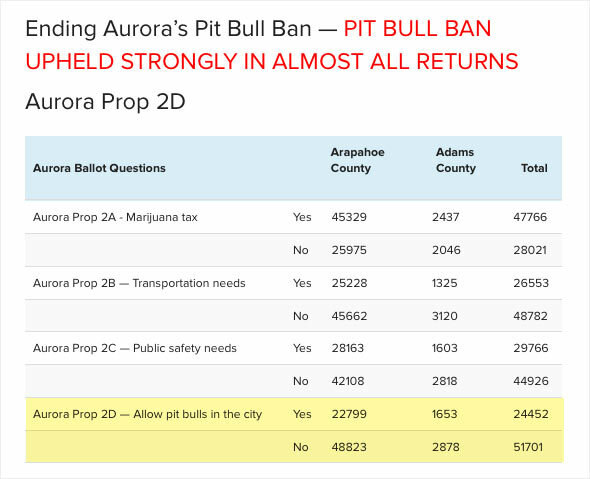 The Aurora Sentinel election blog now reports that, "By a 2-to-1 margin, Aurora voters say they don’t want pit bulls to return to the city, based on early returns. With more than 70,000 votes counted across Adams and Arapahoe counties so far, voters have overwhelmingly said no to Aurora ballot question 2D, which would lift the city’s 9-year-old ban on the dogs. In Arapahoe County, 68 percent of voters said no. In Adams County, 63 percent voted against lifting the ban." First results in from two counties now -- Aurora is part of three counties. 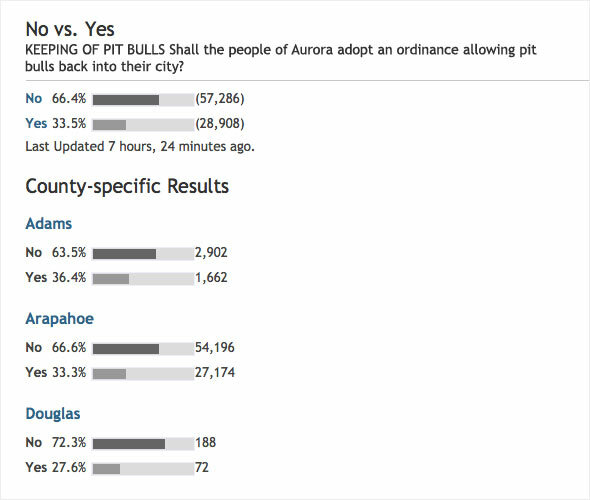 So far, Aurora voters are showing OVERWHELMING support of the city's pit bull ban. It is over a 2 to 1 margin. Douglas County is a growing area of Aurora, but still only contains small voting numbers. The founder of DogsBite.org told Colorado Public Radio on Oct. 28, "We’d like to see more city councils putting it on the ballot. Our theory is that the majority of Americans don’t want to live next door to a pit bull." First returns are in -- first returns consist mainly of mail-in ballots. Second returns are expected at about 8:00 pm Mountain Time and will include ballots cast today. 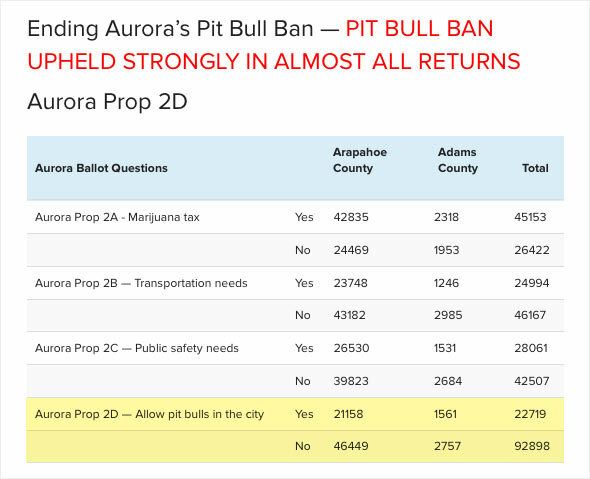 First returns for Proposition 2D show that Aurora's 9-year old pit bull ban is so far being upheld by voters by a large margin. The language specifically is: Shall the people of Aurora adopt an ordinance allowing pit bulls back into their city? So far into the evening, 46,449 have voted No and 21,158 have voted Yes. A hot tipper from the Aurora, Colorado area writes into DogsBite.org that CBS News is reporting a whopping 55% turnout in Colorado for the 2014 midterms -- 1.6 million ballots. First returns are expected to be reported shortly after 7:00 pm Mountain Time -- immediately after the polls close -- and will consist mainly of the mail-in ballots. The second report will be around 8:00 pm Mountain Time. This latter report should be the most telling, as it will be updated with ballots cast today. The Arapahoe County Elections website (ArapahoeVotes.com) went offline for over 5 hours today. Arapahoe County is one of three counties that is part of Aurora. 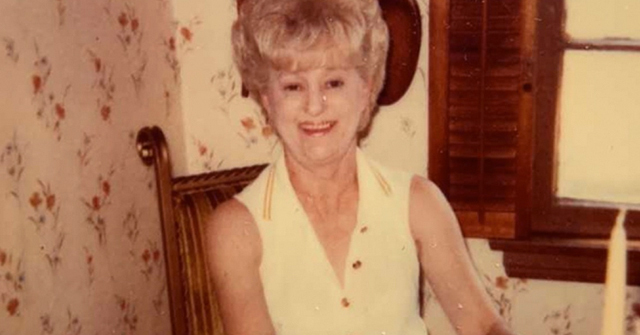 Local county officials blamed the Florida vendor that manages the website. The site came back online at about 2:15 pm. In other Aurora news, as of yesterday, Aurora police have still not located the alleged "aerial attacking" pit bull that leapt from a second story balcony and attacked and killed a small shih tzu last week. Aurora, CO - Welcome to Election Day 2014 readers. 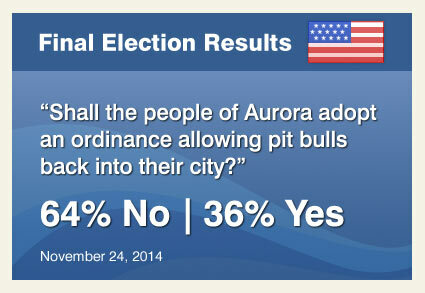 Today marks an historic day for our cause as citizens of Aurora vote on their pit bull ban. This is the first general election to determine this issue. In 2012, during a primary election, the citizens of Miami-Dade County voted to keep their pit bull ban by a 63% margin. Today and after the polls close in Aurora, we will be live tweeting election news for Proposition 2D and following the Aurora Sentinel election blog and Twitter feed. Follow the DogsBite.org Twitter feed and related conversations on our Facebook page. Many parts of the country are watching the Colorado midterm election this year because this is the first major election since the state shifted to all mail-in ballots in 2013. There are also several key congressional races in the state; one is Aurora-centered as well. The City of Aurora is part of three counties, Arapahoe County, Adams County and Douglas County, so election results will be compiled from three areas. When the results become available, they will also be published here. The county clerk must receive all ballots by 7:00 pm on November 4. This means received, not postmarked (military and overseas voters have eight more days to get their ballots in). There are also designated ballot drop-off locations in each county. To see a sample ballot for each county -- Proposition 2D is the fourth Aurora initiative -- please click one of the following: Arapahoe County Sample Ballot, Adams County Sample Ballot and Douglas County Sample Ballot. The Aurora Sentinel has been covering the city's pit bull ban for a number of years. Most recently they published an editorial about Proposition 2D, covered the October advertising "drama" instigated by pit bull devotees after Daxton's Friends placed an advertisement in "YourHub" and picked up the AP article, Aurora pit bull vote could spur a national trend. In May, the PerryBlog responded to the Aurora City Council's decision to place the measure on the November ballot. 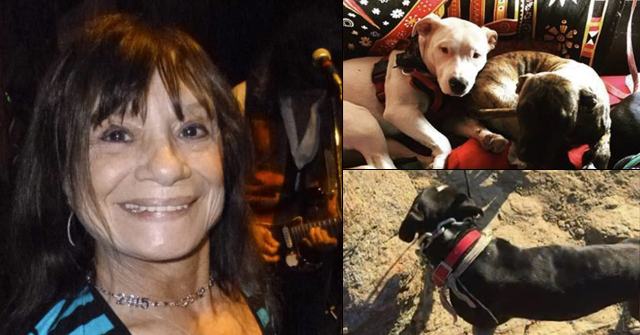 "Let's hope that the people of Aurora chose LIFE AND LIMBS over the irresponsibility of Pit Bull owners and the ferocity of their dogs." "Now the city council can get back to work and not have their meetings hijacked." "That flying pit bull story did NOT help. ColoRADog's ad looked like a Jimmy Hendrix poster." "Yes, yes, yes, yes, YES!!!!" "I have not seen a final total, but for all intents and purposes it is. The people have spoken and it's a resounding landslide." "The ban is upheld by voters by a large margin." I'd like to see numbers.."
"So far it is better than two to one." "Current totals 22,719 to drop the ban and 49,206 to keep the ban." "Thank goodness for common sense and the powerful desire to live in as much peace and safety as a vote can possibly bring. Power to the people!" "When Are You Going to Call Aurora 2D? 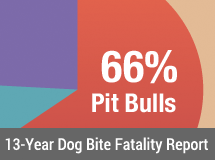 — Allow pit bulls in the city Yes 22,719 No 92,898 – a Mauling!" "The lives of children matter to us regardless of which city they live in !!!" 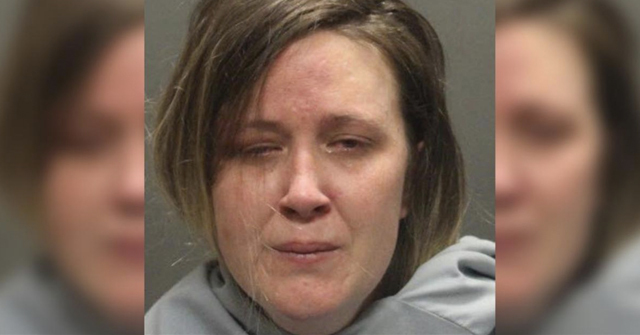 OTOH, there's very bad news from Pima County, Arizona. The build a bigger shelter (for pit bulls) initiative won big. This was the work of a local no-kill group (and its unwitting helpers). All I can say is this: If you voted for this initiative, you OWN the consequences. All of them. Including the increased attacks and maulings. I sent an email to my county board representative with the numbers from this ballot measure. He voted to allow our county shelter to adopt out pits after years of banning the practice. Of course this was all kept very hush hush and the only people he heard from were proponents until after the fact. I basically told him that no matter how vocal and well-organized pit advocates are, the bottom line is that they are a minority of voters, period. Normal people do not want these dogs in their neighborhoods and in the future he needs to think about the political consequences of putting public safety at risk.